If your preferred mode of transportation has two wheels, it’s about time you learned about the bike-friendly town of San Marcos, Texas. It may be known for its famous spring-fed river, but the area is as much of a haven for cyclists as it is a paradise for kayakers and snorkelers. San Marcos is especially welcoming to cyclists thanks to the implementation of Complete Streets. The idea behind Complete Streets is simple: The community believes that streets should be shared by pedestrians, cyclists, and vehicles. You’ll notice protected bike lanes around San Marcos as well as multi-use paths that allow you to explore the city’s hills, waterways, and historic downtown. Ready to take advantage of the bike lanes and trails in and around San Marcos? Whether you’re looking to log a few miles for fun or you want to take on an epic adventure, here are five road biking rides to explore. This leisurely ride takes you between two scenic patches of nature without forcing you to stray too far off the beaten path. Start at Stokes Park, where you can take a moment to admire a man-made waterfall surrounded by lush vegetation. From here, you’ll follow a mostly flat route with light traffic and a wide shoulder down Cape Street onto River Road. The route ends after 4.6 miles at another hidden gem: Blanco Shoals. This area is mostly undeveloped, so if you’re up for it, do take the time to explore on foot or continue on bike if your tires are equipped for riding off-road. Once you’ve gotten your fill of nature, head back the way you came and reward yourself with a craft beer from Ivar’s River Pub. It has excellent food and a beautiful two-tiered patio for outdoor dining. Rio Vista Park is one of the best jumping off points for any San Marcos adventure. If you want an easy, scenic ride that will remind you just how special the San Marcos River is, this is the one for you. This flat route down CM Allen Parkway takes you along the eponymous river to Spring Lake, the very source of the miraculously clear water. This is a great summertime ride that will provide you with ample opportunities to enjoy the wildlife along the way. If you look hard, you may even spot the San Marcos salamander. Best of all, when you’re done with your ride, you can take a dip at Rio Vista Park or even rent a tube from the nearby Lions Club and experience the rapids. 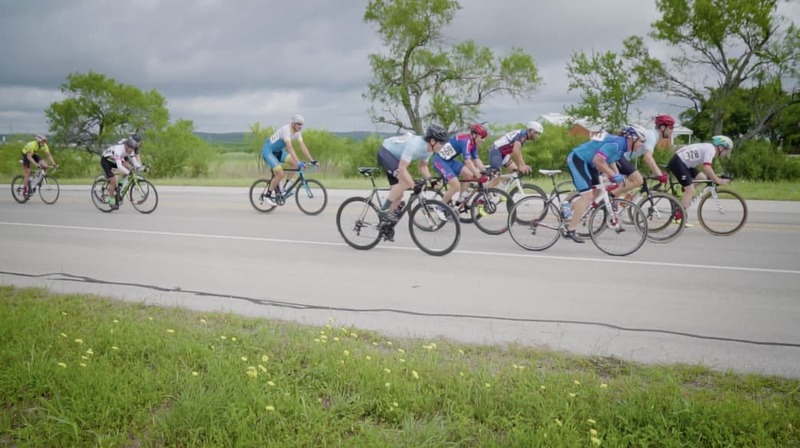 Just 35 miles from Austin, San Marcos has become a destination for cyclists. While it’s rare to hear anyone sing the praises of I-35, the infamous Texas highway does hold the bulk of the area’s traffic, leaving farm-to-market roads and other less popular roads largely free from vehicle traffic. Such is the case with this loop, which begins from the Castle Forest Greenspace on Craddock Avenue and makes a loop around Ranch Road 12. The Ranch Road 12 portion of the ride is tree-lined and offers a wide shoulder. Along the way, you’ll enjoy rolling hills, as is the case of many of the classic hill country rides in the area. When you’re finished, head to Sunny’s Pizza and Wings on Craddock Avenue for one of the restaurant’s popular stuffed-crust pies. 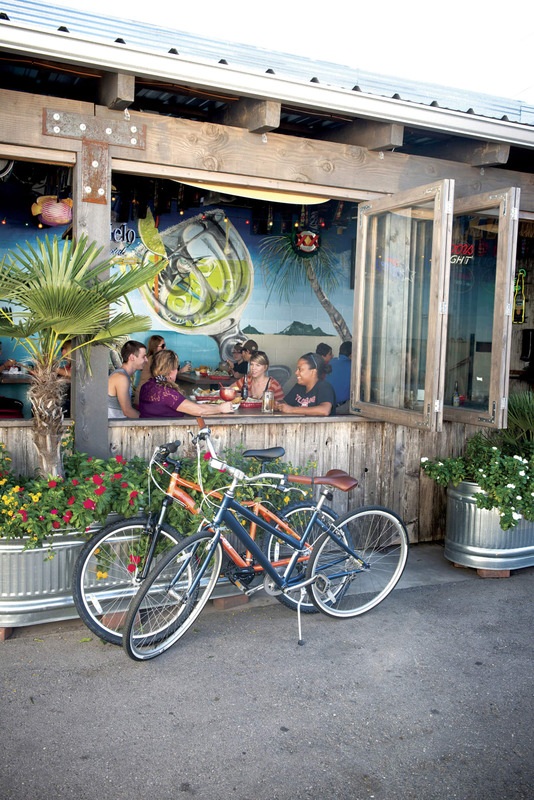 Downtown San Marcos is filled with bike-friendly destinations for relaxing after a ride. The city of San Marcos is home to 1,200 acres of nature preserves spread across six separate areas. Much of the 22 miles of trail on this land is dirt—great if you’ve got a mountain bike but not necessarily appropriate for road bikes. Fortunately, this route allows you to access two of the finest natural areas in San Marcos via pavement. Start at the Ringtail Ridge Natural Area and take Old Ranch Road 12 to Craddock Avenue. From there you’ll turn left onto Ranch Road 12 and take it through the Purgatory Creek Natural Area. You can turn back at the Hunter Road Intersection, or turn left onto Hunter Road and head back into town. Feeling hungry? Turn right at the intersection and ride for a mile to San Marcos BBQ. Skip the traffic on I-35 and take the scenic route to Austin by journeying there on your road bike. This challenging ride makes for a great weekend adventure. Advanced cyclists can do an out-and-back in a day or make a one-way trip and arrange for transportation back. To tackle this route, start from Post Road in San Marcos, just off of Spring Lake. Take it to Old Stagecoach Road where you’ll travel for 5.7 miles before continuing to Jack C. Hays Trail. Here, ride for six miles and then turn left onto Main Street, where you’ll travel through the small town of Buda. Turn left on Old San Antonio Road. This will take you to South Austin, where you can take 1st Street to whatever part of the city strikes your fancy. We suggest connecting to Congress Avenue, where you can grab a bite to eat in the SoCo neighborhood or continue on to downtown. In addition to earning you some serious bragging rights—this route takes you through rolling hills, small towns and picturesque riverside parks that define the Texas Hill Country. Happy riding! Written by Krista Diamond for RootsRated Media in partnership with San Marcos CVB.